Happy T Day ladies. It's another Tuesday and in my world we have snow moving in at some point today. And like many of you, the cold is back. I hope everyone is managing to stay warm if you are in the arctic cold zone. 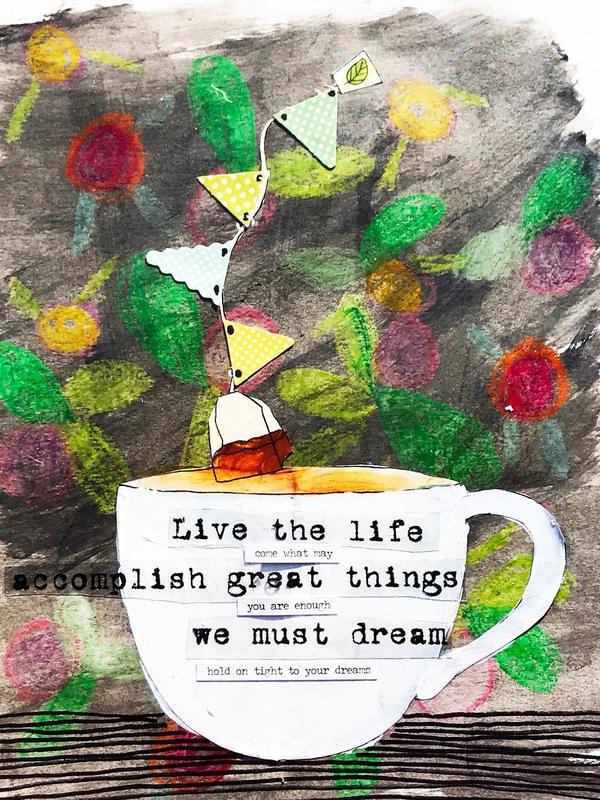 So first of all, for Art Journal Journey, I have some tea bag philosophy. This month I am hosting and the challenge is New Year: New Adventures. I know a cup of tea might not be so adventurous, but sometimes the tea bags have little sayings printed on their paper tag ends and wondering what your tea bag might tell you is always a fun little adventure. My art adventure was to use crayons and doodle these flowers, and then I painted over them with some watered down out black paint. It created an interesting background. Then I cut the tea cup and tea bag out of a magazine, and then after painting the cup white, I added the tea bag philosophies as well as the triangular banners along the tea bag string. And now for my T Day drinks since today I have 2 to share with you. Well it was Friday, and I had just worked my first 5 day week in a long time. So while I munched down on some chips, salsa and guacamole, I had a little drink. A margarita hit the spot and reminded me of summer. Then I had my taco salad and a glass of water, both of which you can see here. I hadn't had a taco salad in quite a long time also and boy did it taste good. Stop by Bleubeard and Elizabeth's blog to see what the T Gang is up to this week. And we'd love for you to join in also. All you need to do is link up a post showing a drink related post. Thanks for visiting my blog also. Hope you have or are having a great Tuesday. What a fun Art Journal Journey page today, Erika. Your adventure in tea and tea sayings is lovely. That background is fabulous. And of course, I adore the tea bag and tags. This wonderful entry is simply perfect for Art Journal Journey today. I'm now hungry for a taco salad. Yours looks surprisingly good, too. The shell looks good enough to eat (grin). You may keep your margarita and I'll take the water and lemon, and of course, the guacamole. Thanks for sharing your wonderful AJJ art and your margarita and water with us for T this Tuesday. Hope it's not as cold there as it is here. My elderly neighbor, Prissy, used Salada tea with the sayings on the tags. Was always fun to read our teabags when we had tea. I really miss the old girl. So your wonderful page is a happy memory for me. I love eating out. No cooking or cleaning up. 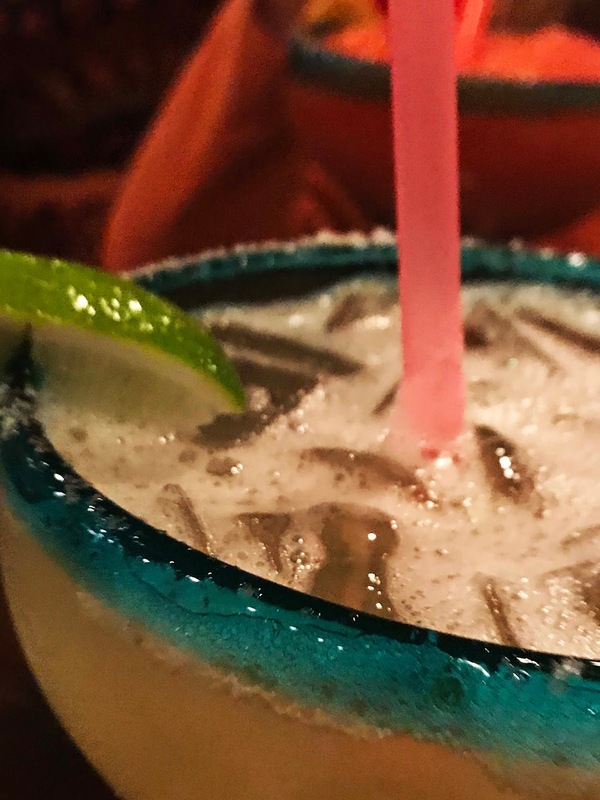 Pretty blue rim on your margarita. The taco salad looks good, too. Stay warm. Maybe you'll get a snow day tomorrow. Do you have to make your snow days up at the end of the year? Its a fantastic tea cup page, a super background for the white cuppa. The quote and words were super as well.The margarita looks inviting, I've never had one in ages, maybe come summer I'll remind my taste buds on how nice the drink is. The food looked delicious as well. Happy T day wishes. Stay safe and warm. Good morning,yes we are in the arctic cold zone again too brrrr but by end of the week up to the 50s again lol at least we get these nice thaws and breaks from the bitter cold. Margaritas are my favorite drink, I love to make mango margaritas in the summer-and your food looks so delicious-I would enjoy that. Oh now you have me hankering for some good Mexican food, along with a summery margarita of course:) Fabulous journal page! That is a very interesting background, muted just enough to allow the teacup and words to pop. Wishing you a happy T day! Yum, that taco salad certainly looks good. It is so good going out every once in a while, especially with people you love. I like your journal page with the tea bag. I have never seen sayings printed on the paper tag. That must be a typical American thing. But it is fun. 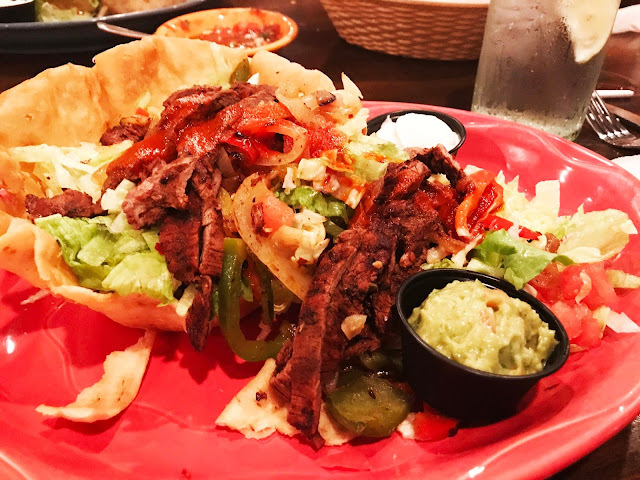 I enjoy Mexican food, and your taco salad looks delicious! Even the smallest thing can be an adventure -even a cup of tea- depending on your attitude :) Happy T Tuesday! What a fabulous journal page. I love the banner as the tea bag string. So creative. And such a great background!
" If you truly love nature, you will find beauty everywhere." It was a whole -2° this morning when I walked the dogs. It was a very short walk. Mini wanted to be carried back in again. It's sounding like a good day to bake again... maybe turkey pot pie. I should just stop reading blogs first thing in the morning before breakfast! Seeing your banner motivates me. Maybe it's time to make a valentine banner! What a fabulous page - many of our travels are planned with a cup of coffee in hand! That food looks so delicious that I think it's time we went for a trip to a Mexican restaurant! Love the journal page! And Mexican food....yum!!!!! Looks so good...makes me want to make nachos later!